Sam and Pete contacted me with some specific ideas in mind for their passport invitations. Its great working with a couple who know what they want but are also open to suggestions from me! "My fiancé and I decided that we wanted passports for our invitations and after looking on the internet for ideas we happened to stumble upon Kate’s website. We didn’t want common looking passport invites that we had seen on other sites, but rather something fun, different and heavily customised. Kate was really helpful from the start. Through a combination of our own ideas and Kate’s creativity, we came up with about 3 different designs." I designed Sam a multiple page passport as she wanted more space to give her guests additional information about their chosen wedding destination. Sam and Pete also asked if I could design a map of where they got engaged and one of where they were getting married. This wasn't a problem and was included as part of the design fee for their order. "Kate communicated with us throughout the process and always did her best to make sure we were happy. Once we decided on the design, Kate showed us a number of proofs until the design was finalised. 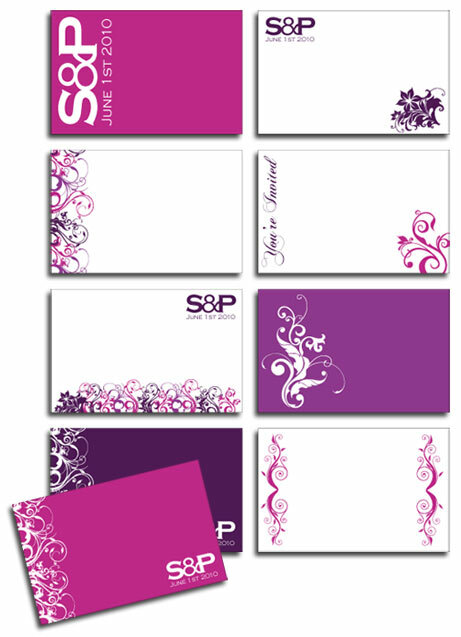 Once the invite was complete we even decided to get some beautiful address labels designed to match. We have been really happy with the work and have had loads of lovely comments about how amazing and different our invites are. We would highly recommend Kate’s work to anyone." I thoroughly enjoyed working with Sam and Pete on their wedding invites and was particularly happy with the finished result. I was even contacted by another couple recently who, having seen a sample of Sams invite, wanted me to base their own Passport Invitations on the design. Rozina and Vinney needed even more pages of information for their wedding in Turkey so I created a version with 12 sides. 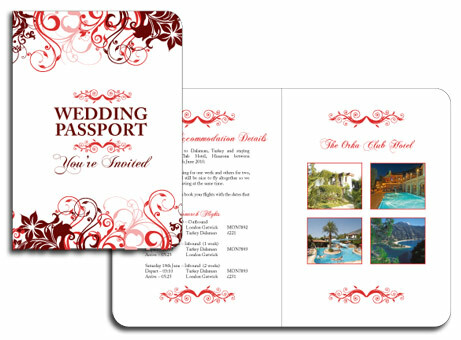 They chose a red theme for their invites based on the Turkish flag and also included photographs of themselves and their destination to personalise the design. Finished reading about the Passport Invitations I created for Sam? 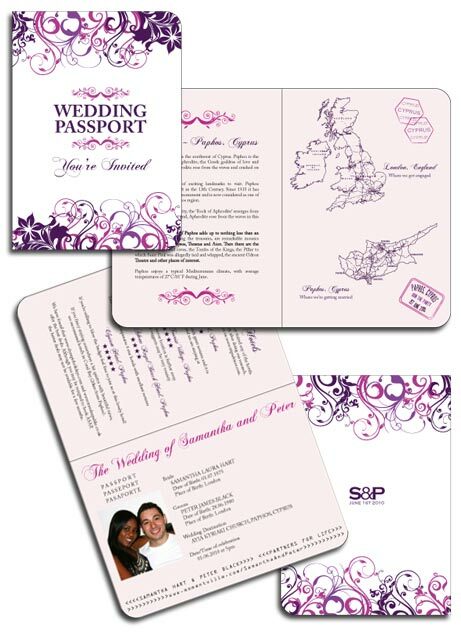 Please contact me to discuss options for your own Passport Wedding Invitations and to see more examples I have created for other couples.